The process is simple and straightforward! The student must be enrolled in a complete program this means that no credit hours can be awarded. The student cannot miss more than 10% of their scheduled hours to receive this tuition reward. We offer a number of interesting programs, including medical assistant, pharmacy technician, medical office specialist, and others. Whether you’re interested in phlebotomy classes, business office training, medical billing and coding, or working in a pharmacy, SWS can help! 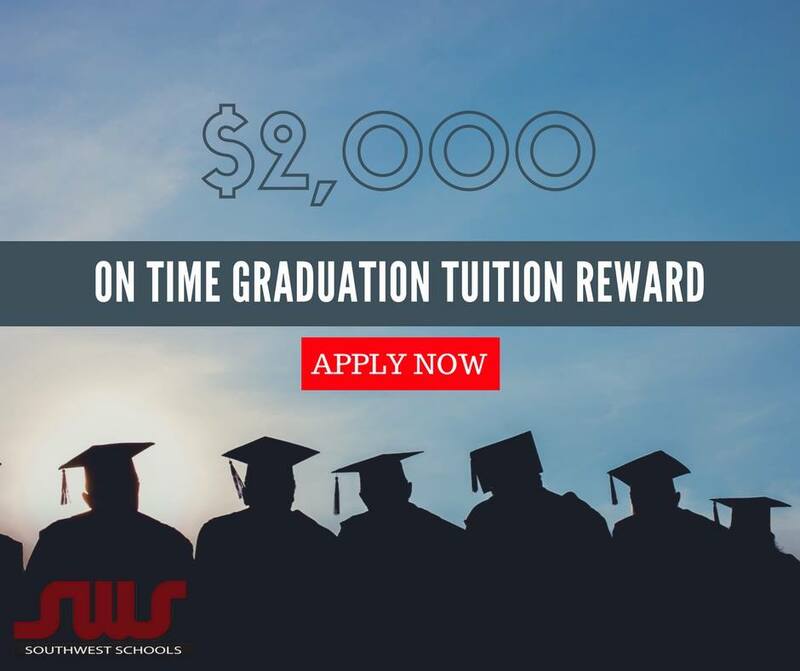 Upon graduation the student’s cost of tuition will be reduced by $2,000! This means you will be graduating with less borrowed debt and entering your desired workforce with a reward for your extra effort. This money could be used toward building your client list and purchasing the tools necessary for your new job. We also encourage you to speak with our financial aid office! We have a team of experts who are prepared to explain the wealth of financial aid options offered by Southwest Schools. No matter your financial situation we can help you to apply for assistance and answer any eligibility questions you might have. If you are interested in learning more about our On-Time Graduation Tuition Reward and your financial aid eligibility, please reach out! Click here to request more info.